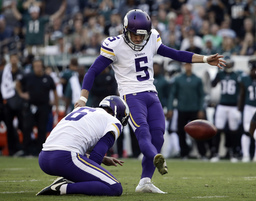 EAGAN, Minn. (AP) The Minnesota Vikings have agreed to terms on a new contract with kicker Dan Bailey, the ninth-year veteran who was signed last season to replace struggling rookie Daniel Carlson. Bailey's deal was done Tuesday, bringing the fifth-most accurate field goal kicker in NFL history (86.6 percent) back to a team that has lacked reliability and stability at the position for the past five years. Carlson, a fifth-round draft pick, was cut after two games. Bailey's performance was mixed at best, making 21 of 28 field goals and 30 of 31 extra points. He suffered a groin injury in 2017 with Dallas, leading to his departure from the Cowboys. He posted a career-worst field goal rate of 75 percent in each of the past two seasons.